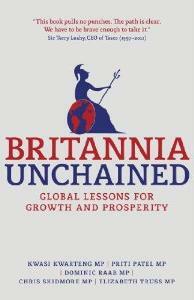 Britannia Unchained: Global Lessons for Growth and Prosperity is a political book written by several British Conservative Party right-wing MPs. It was released on 13 September 2012. Its authors present a treatise, arguing that Britain should adopt a different and radical approach to business and economics or risk "an inevitable slide into mediocrity". The book is written by Kwasi Kwarteng, Priti Patel, Dominic Raab, Chris Skidmore and Elizabeth Truss – five Tory MPs who were elected in May 2010 and belong to the party's Thatcherite-leaning Free Enterprise Group. The text sets out their vision for the United Kingdom's future as a leading player in the global economy, arguing that Britain needs to adopt a far-reaching form of free market economics, with fewer employment laws, and suggesting the UK should learn lessons from the business and economic practices of other countries, including Canada, Australia and the tiger economies of the Far East like China and Singapore. An article written by four of the authors for the ConservativeHome website, and published on the day of the book's publication said, "We are convinced that Britain’s best days are not behind us. We cannot afford to listen to the siren voices of the statists who are happy for Britain to become a second rate power in Europe, and a third rate power in the world. Decline is not inevitable." The content suggests that Britain has lessons to learn from a number of other countries regarding policy, which it claims are outperforming the United Kingdom, and sets out the areas where the UK needs to rethink its strategy, citing examples of countries which the authors believe have been successful in these areas. On deficit reduction the example of Canada during the 1990s is given, where overall spending was reduced by 20% between 1992 and 1997. On education the authors lament the relatively low number of students who study mathematics at A Level, which they say is 15%, contrasting it with Japan where 85% study the subject at a similar level. In the realm of business and economics, Israel is cited as an example of a country that supports innovation, while the United States is given as an example of a nation that supports risk-taking. The willingness of Britain's employees to work hard is compared to that of workers of other countries, with suggestions that a decreasing number of Britain's workers are contributing towards economic growth, through which state spending is enabled to be maintained. It is asserted that this undermines the UK's competitiveness. The book caused controversy in August 2012 after a short extract appeared in London's Evening Standard which accused British workers of laziness, and lagging behind their Asian counterparts. Part of this was later reprinted in The Guardian: "The British are among the worst idlers in the world. We work among the lowest hours, we retire early and our productivity is poor. Whereas Indian children aspire to be doctors or businessmen, the British are more interested in football and pop music." The comments were criticised by union leaders, among them the General Secretary of the Trades Union Congress Brendan Barber: "The problem with the UK economy is not its workers, but a severe lack of jobs." The Labour Party urged British Prime Minister and Conservative leader David Cameron to distance himself from the views, and the Shadow Secretary of State for Business Chuka Umunna commented: "First they blame British businesses for their economic failures and now they blame the people who work within them, showing how out of touch the Tory party has become." Speaking later to The Guardian one of the authors, Dominic Raab, claimed the passage had offered "a skewed and inaccurate reflection of what is in the book". Writing for the New Statesman, Jonathan Portes criticised the accuracy of the content, saying the book contained "factual errors" and evidence of "slipshod research" by the authors. "The authors of Britannia Unchained – five Conservative MPs including Elizabeth Truss and Dominic Raab – argue that Britons are 'idlers . . . obsessed with the idea of the gentleman amateur'. Sadly, so far the reaction to the book has proved their point. They’ve had headlines in the Daily Mail and The Telegraph and The Guardian has marked them out as the young Tories to watch. Job done. Yet they’ve done it without doing any serious research, let alone thinking about what that research might mean. They have joined the political version of celebrity culture – the same culture that they argue, to some extent compellingly, makes Britons believe they can get on without doing any hard work." ^ a b c d Beckett, Andy (22 August 2012). "Britannia Unchained: the rise of the new Tory right". The Guardian. Guardian Media Group. Retrieved 1 September 2012. ^ a b ""Factual errors" and "slipshod research" - the Britannia Unchained Tories must try harder". The New Statesman. 13 September 2012. Retrieved 18 September 2012. ^ a b Skidmore, Chris; Kwarteng, Kwasi; Raab, Dominic; Patel, Priti (13 September 2012). "Britain's best days are not behind us Comment". ConservativeHome. Conservative and Unionist Party of the United Kingdom. Retrieved 18 September 2012. ^ "British workers 'among worst idlers', suggest Tory MPs". BBC News. BBC. 18 August 2012. Retrieved 1 September 2012. ^ a b Ramesh, Randeep (17 August 2012). "Tory young bloods say Britons are idlers who need to emulate Asia". The Guardian. Guardian Media Group. Retrieved 1 September 2012.